The 2016 Utah gubernatorial election was held on November 8, 2016, to elect the Governor and Lieutenant Governor of Utah, concurrently with the 2016 U.S. presidential election, as well as elections to the United States Senate and elections to the United States House of Representatives and various state and local elections. Incumbent Republican Governor Gary Herbert ran for re-election to a third term in office. Republican challenger Jonathan E. Johnson defeated Herbert in the state convention to secure a spot on the primary ballot, but Herbert won the June 28, 2016 primary and secured the nomination. The Democrats nominated former CHG Healthcare Services CEO Mike Weinholtz at the Utah Democratic convention in April. Republican Governor Jon Huntsman, Jr. resigned in August 2009 to become United States Ambassador to China and Lieutenant Governor Herbert succeeded him. He was elected to serve out the remainder of Huntsman's term in a 2010 special election and was re-elected to a full four-year term in 2012. Former Speaker of the Utah House of Representatives Rebecca D. Lockhart was widely believed to be a potential Republican candidate, but she died of a rare neurodegenerative brain disease in January 2015. Incumbent governor Gary Herbert won the June 28, 2016 primary, defeating Overstock.com Chairman Jonathan Johnson. Weinholtz defeated Cook at the Democratic convention to become the nominee. → Internal poll conducted on behalf of the Utah Republican Party. ^ "Official Utah Election Calendar". ^ a b c d "Governor Herbert says he will run for re-election in 2016". The Salt Lake Tribune. June 25, 2014. Retrieved August 22, 2014. 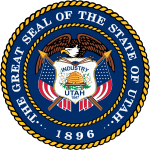 ^ "Fox 13 Utah: Governor Gary Herbert Forced Into Primary Election by Jonathan "JJ" Johnson". ^ a b Roche, Lisa (June 28, 2016). "Gov. Gary Herbert wins GOP nomination". Deseret News. Retrieved June 29, 2016. ^ a b Leonard, Wendy (April 23, 2016). "Utah Dems nominate Weinholtz to run for governor". Deseret News. ^ "Becky Lockhart, Utah's first female House speaker, dies". FOX13. January 17, 2015. Retrieved January 18, 2015. ^ Frandsen, Eric (March 13, 2015). "Former Overstock CEO speaking in Logan Monday and wants to be Utah's next governor". Cache Valley Daily. Retrieved March 14, 2015. ^ Gehrke, Robert. "Democrat relies on outsider status, business success in bid for Utah governor". The Salt Lake Tribune. Retrieved 2016-01-22. ^ Cook, Vaughn. "Personal Note from Vaughn Cook". Utah County Democrats Facebook Page. Retrieved 2016-01-06. ^ Schott, Bryan (November 30, 2015). "2016 Candidate Tracker - Congressional and Statewide Offices". Utah Policy. Retrieved December 25, 2015. ^ "GOP Utah governor candidate Johnson to debate Democratic lawmaker Dabakis". The Salt Lake Tribune. November 25, 2015. Retrieved December 19, 2015. ^ "Is a run for governor or Senate in Matheson's future?". The Salt Lake Tribune. December 23, 2013. Retrieved December 24, 2013. ^ Cheney, Kyle (December 29, 2014). "16 in '16: The new battle for the Senate". Politico. Retrieved December 29, 2014. ^ "2016 Governor Race ratings". The Cook Political Report. Retrieved December 15, 2018. ^ "Our Final 2016 picks". Sabato's Crystal Ball. Retrieved December 15, 2018. ^ "Gubernatorial Ratings". The Rothenberg Political Report. Retrieved December 15, 2018. ^ "Elections 2015-16". Daily Kos. Retrieved December 15, 2018. ^ "2016 Election Maps - 2016 Governor Races". Real Clear Politics. Retrieved December 15, 2018. ^ "Utah Election Official Results" (PDF). Utah Secretary of State. Retrieved December 28, 2016. This page was last edited on 17 February 2019, at 16:26 (UTC).